Plastic debris is providing a new vessel for potentially invasive species to cross large distances. The open ocean is essentially a marine desert. So far from shore, starved of nutrients like phosphorus (which enters the ocean as runoff from land), not much lives out on the open sea. So when living animals started washing up along the coasts of the Pacific Northwest and California, clinging to plastic debris that was swept out to sea by the 2011 Japanese tsunami, 4,300 miles away, it raised a few eyebrows. And when the living animals—mostly shellfish and crustaceans, but also marine worms, sea stars, sponges and even fish—kept arriving year after year, it raised even more. By February 2017, nearly 300 species of living organisms had made landfall on the shores of Washington, Oregon, California and Hawaii. Jim Carlton, professor of marine sciences at Williams College, and colleagues published a study that year in the journal Science documenting the castaways that had made the trip from Japan to North America. Two years later, the animals are still arriving, Carlton said earlier this month at the American Association for the Advancement of Science annual meeting in Washington, D.C. Debris seems to wash up on the shore seasonally, and the most recent recorded sighting of a living animal—a tiny crab—was last July. Somehow, these creatures, adapted for life on the coasts, are surviving at sea for at least seven years—five years longer than previously documented instances of marine rafting. “What we’re waiting for is whether or not the spring 2019 pulse brings to North America the same arrival of Japanese tsunami marine debris and living species that it has for the past seven years,” Carlton says. There’s no reason to think it wouldn’t. Thanks to this research, we now have no upper limit on the length of time coastal animals can survive adrift at sea. The debris from Japan ranged from the small, like buoys, to the very large, like the dock shown in upper right. When the Tōhoku tsunami washed boats, plastic docks, buoys, crates, ropes, and propane tanks out to sea, the natural disaster became the first opportunity to track a large debris field over an immense distance—one of the only times scientists had a known origin point and time for marine junk. “It was as if we had done a giant experiment, tossed out millions of objects with a date on them,” Carlton says. Much of the 2011 debris was made of plastic, unlike the last time Japan was hit by a tsunami of this size, in 1933, many years before the widespread emergence of plastic goods. Wooden objects degrade in the ocean in just two or three years as they are munched on by wood-eating worms, Carlton says, so any organisms that might be clinging to a wooden debris raft only have a couple years to make it to shore. Plastic, on the other hand, doesn’t degrade, which helps explain how a wood-and-fiberglass fishing boat, the Sai-Shou Maru, washed up on a Washington beach in 2013 with five live fish inside. The combination of the emergence of plastic, the probability that climate change will intensify hurricanes and typhoons, and the ability of marine species to drift on the open ocean for half a decade or more creates a new vector for invasive species, Carlton says. For now, it’s not clear whether any of the species that survived the Pacific crossing have established themselves on the West Coast of the U.S. Determining that a foreign organism has taken root takes time and effort. Carlton says his team is already likely missing some organisms, simply because the number of pieces of debris associated with the tsunami is in the thousands or tens of thousands. If a species establishes itself after floating across the ocean, it won’t be the first. Famously, in 1995, a population of 15 iguanas rafted 200 miles on trees ripped from the Caribbean island of Guadeloupe. Enough survived to start a new colony on Anguilla, and they’re now considered invasive. Since that first documented journey, scientists have begun to study how animals of all kinds manage to raft across the seas. Jon Waters, a professor at New Zealand’s University of Otago, studies how mollusks, sea stars and other creatures float on natural rafts made of kelp. Waters, who isn’t involved in the Japan tsunami research, said that kelp is “amazingly robust” and can last up to two years at sea. In this instance, the creatures bring their own food with them—either the kelp itself or the microbial and algal species that live on the kelp. But when creatures raft on plastic, the question of what they eat is more complicated. “We had assumed that food is pretty limited out there,” Carlton says. The Great Pacific Garbage Patch presents a unique opportunity to study the organisms’ “pre-landing story,” as Carlton calls it. 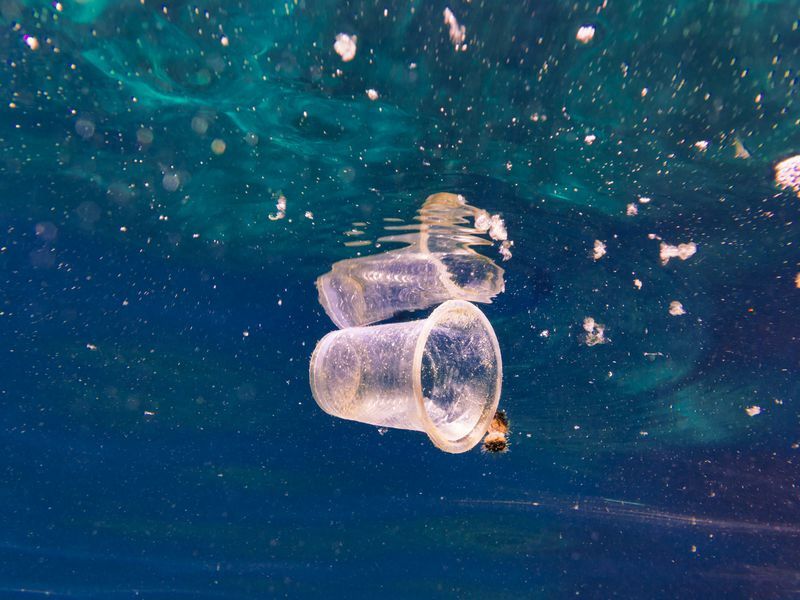 Linsey Haram, a postdoctoral fellow at the Smithsonian Environmental Research Center, is planning to study samples from the Pacific gyre to learn more about the communities that live on the ocean between the coasts. Hopefully the study will shed light on what rafting animals eat. Haram said via email that the hitchhikers might “be living off of algae, animals and detritus present on their singular ‘rafts,’” or they may be surviving off the limited plankton and dissolved minerals in the water. Animals have been rafting across seas for millennia. Madagascar was probably populated by animals that rafted from mainland Africa 60 million years ago. But our plastic waste has made it possible for organisms to travel farther and longer than we ever thought they could.